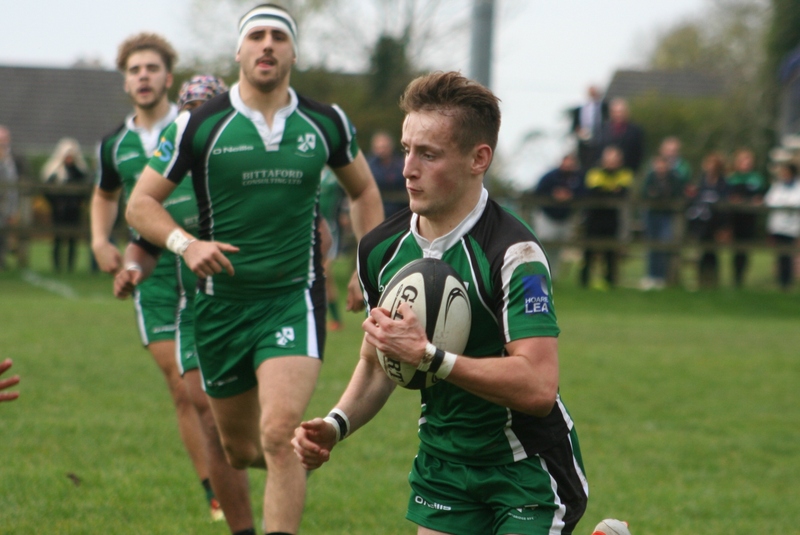 PLAYER-COACH Lewis Paterson marked his 100th senior appearance for Ivybridge by scoring a try as they beat Bournemouth 35-10 at Cross-in-Hand in National Three South West. Paterson went over for Ivybridge’s fourth touch-down in a convincing performance as they bounced back from last weekend’s disappointing loss at Old Redcliffians. Their other try scorers were young backs Toby Evans, Mitch Pinkus and Damon Akerman, with Billy Pinkus kicking the rest of their points. Paterson admitted he had tried to treat the game just like any other, but was pleased to get the win – and a try – to mark his special milestone. “The boys were really complimentary in the changing room before and said they wanted to make it a real memorable day,” said Paterson. “But as a coach as well I was trying not to look at the emotional side and just keep it as a normal game day. Paterson’s 50th-minute try came after three other players had failed to gather the ball following a kick forward and it just fell perfectly for him. “They always say never underestimate the bounce of a rugby ball, and it was one of those,” he laughed. Paterson was delighted his team were able to pick up a full five points after their loss at second-placed Old Reds last weekend. 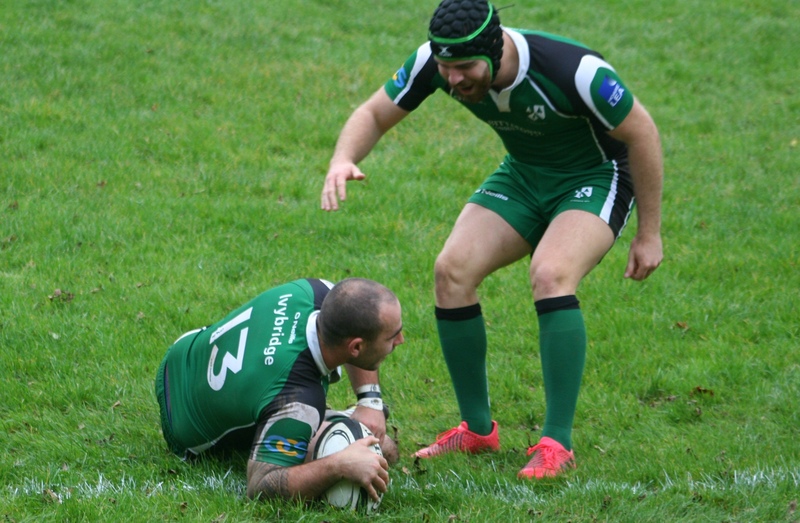 Ivybridge stay fourth but are only two points now off second spot. “We got our four tries,” said Paterson. “But the idea was just to keep the scoreboard ticking. “Every time we were in the 22, regardless of whether we were dominating the scrum, we just wanted to come away with points. We just kept coming away with points, having a relentless home ground attitude. Ivybridge did take their foot off the gas in the final 20 minutes against Bournemouth, but did not let their visitors cross the whitewash during that period, despite some pressure. “We got our points and maybe we felt we were in a comfort zone” said Paterson. “There were still elements of good line-breaks, but I just think our reactions and energy then had just started to die off, but we held them out. “They (Bournemouth) came back strong and didn’t give up, but neither did we in defence. But I just felt we could have done more in attack in the last 20. 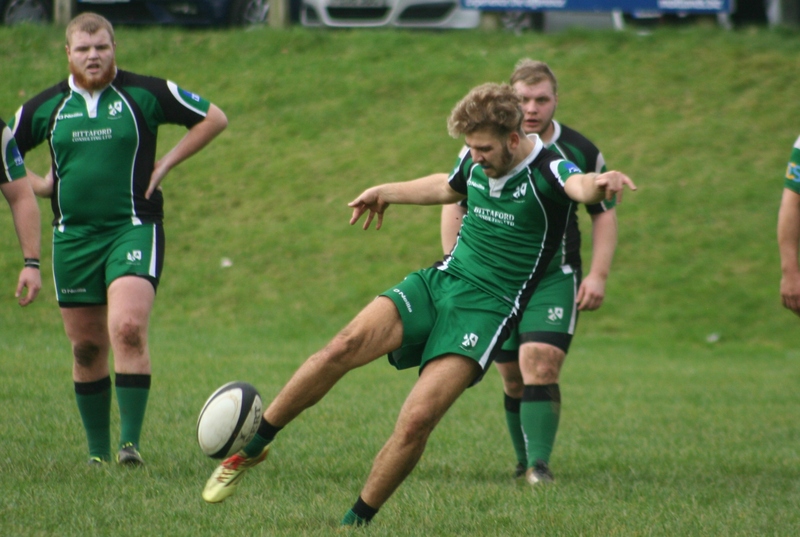 Ivybridge came out determined and Mitch Pinkus narrowly missed a drop-goal attempt before his older brother did give them the lead with a penalty on 12 minutes. Ivybridge made it 10-0 when winger Evans scored after good play by centres Paterson and Jordan Anderton. Captain Anderton made the initial break that nearly saw Akerman score, but Ivybridge recycled well and Paterson put a clever cross-field kick in which Evans collected to score in the left corner. Billy Pinkus brilliantly added the conversion. Bournemouth reduced the gap five minutes later with a penalty from Grant Hancox before teenage fly-half Mitch Pinkus scored his first league try with an interception try from his own half, which his brother converted. And, in first half injury-time, full-back Akerman scored in the left corner after gathering a kick through after some good attacking play by the home side. Billy Pinkus again converted to make the half-time score 22-3. Bournemouth reduced that gap five minutes after the interval when Alex Everett-Bolter went over under the posts and Hancox converted. However, with the visitors a man down for 10 minutes, Ivybridge struck with Paterson scoring, which Billy Pinkus converted. Pinkus then kicked two penalties to put Ivybridge 25 points in front with just over 15 minutes to go. Bournemouth had a couple of good chances late on but could not take them. 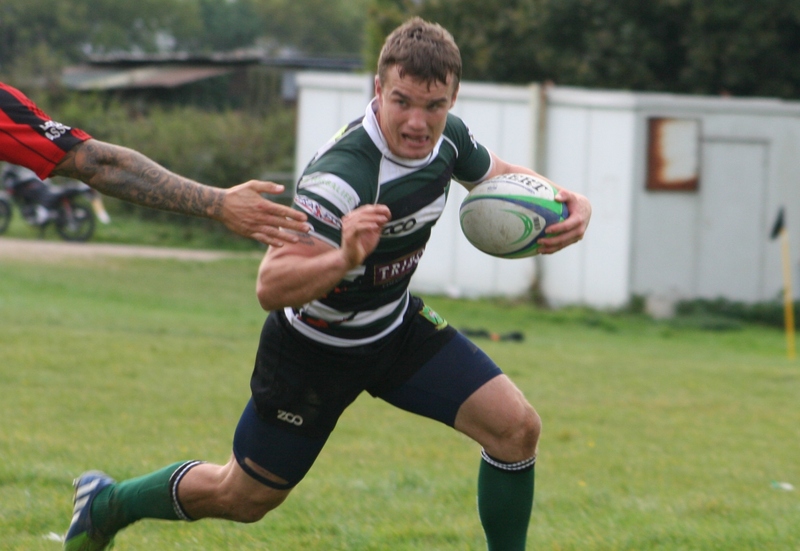 DEVONPORT Services nearly let a 24-point lead slip away at Sidmouth in Western Counties West. 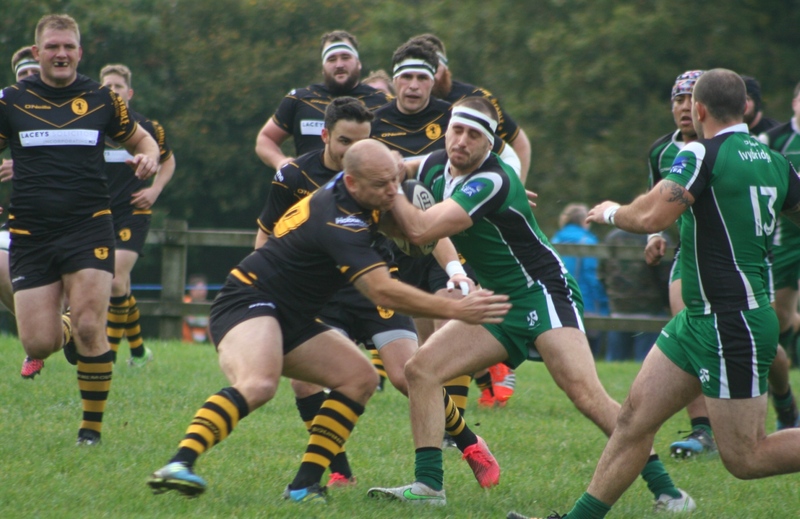 Services looked to be cruising to victory when they went 24-0 up and then 29-5 in front, but Sidmouth had other ideas and nearly snatched victory at the death. Devonport, though, managed to survive some frantic final few minutes to claim a 29-26 victory to bounce back from last weekend’s defeat by Torquay. “It was hearts in the mouth time with the last play of the game,” admitted Service team manager Kieran Leach. But Services did get the win they wanted, which keeps them fifth and just two points off second spot. Services handed a debut to 35-year-old prop Matt ‘Jan’ Gildard and also gave a start to fellow prop Jack Martin, who had re-signed for the club in mid-week from Tamar Saracens. And Martin took just a matter of minutes to get his name on the scoresheet with a try, which Matt Anstis converted. Winger Luke Stannard increased Services’ lead by crossing in the corner. Anstis again added the extras and then kicked a penalty to make it 17-0, which was the half-time score. Devonport, playing down the slope second half, increased their lead to 24-0 with a try by Joe Semple after good play by Brandon Andrews. Sidmouth got their first try minutes later, but Services responded instantly with a touch-down from Phil Greensides following a scrum. But then Services found themselves on the back foot and they nearly gifted Sidmouth the win in the dying seconds, but somehow held out. PLYMSTOCK Albion Oaks made a massive statement in the Cornwall/Devon League by becoming the first team to beat Falmouth this season. A late try by Corey Jamieson secured Oaks a 14-9 victory at Horsham Fields. Oaks have now beaten both the division’s top two teams, Falmouth and Penryn, at their Staddiscombe-based home. “We’ve been waiting to make a bit of a statement all season and we’ve finally done it,” said a delighted Oaks coach Tim Mathias. “I’m really pleased for the lads – they did really well. “As always we made it hard for ourselves. We were 6-0 down within 10 minutes. They (Falmouth) came out really strong and it took us a while to get into our stride. The previous week, Oaks had been lucky to secure a 17-12 away win at Tavistock having spent the entire second half in their own half at Sandy Park. So Mathias was delighted with how his team had responded to that final 40 minutes at Tavistock. “I was really pleased with how the lads adapted this week to last and put the systems into place that we had been working on,” said Mathias. But Mathias is refusing to get carried away by the victory, even though he admits it was one of his best as a coach. “We had some really good wins last year, particularly away, but this is definitely up there with one of the best outcomes for me as a coach since I’ve been there,” he said. “However, I’m not getting too carried away by it. I don’t like looking at league tables. We’ve proved this weekend and other teams have done it in the past that anyone can beat anyone. After going 6-0 down, Richard West pulled Oaks level with two kicks at goal. Falmouth went 9-6 up before West again added another three points. With time running out, West showed a turn of gas to slip through a gap before putting a kick through that Jamieson managed to get to before their visitors. Despite the win, Oaks stay fifth but they are only eight points behind leaders Falmouth now. Saltash remain third after claiming their sixth straight league win. 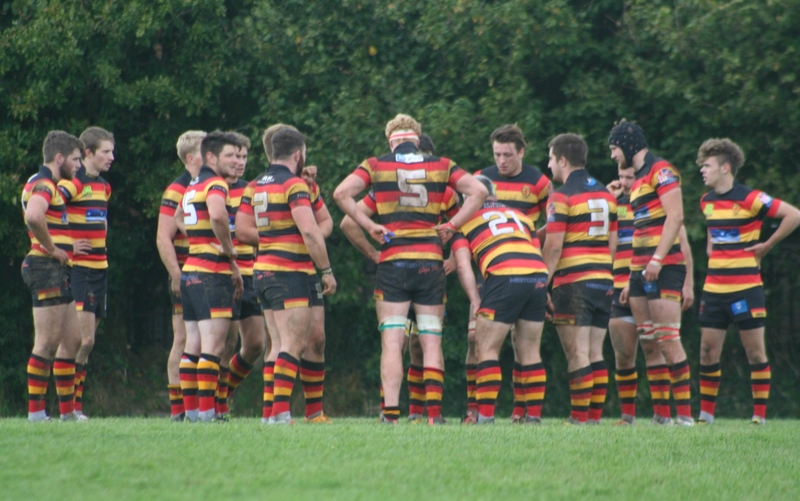 They turned on the style after a slow start to beat Tavistock 48-5 at Moorlands Lane. Tavistock, after their impressive second half display the week before against Oaks, started well against the Ashes and went 5-0 up with a try by powerful back-rower Mark Friend. And the west Devon side continued to frustrate their hosts, who took until the 26th minute to get their first points on the board, which came courtesy of a try by the prolific Will Morton. After that Saltash took control of the game. Captain Ryan Rayner went over for a second try to make it 10-5 before Ryan Cruickshanks and Matt Scott added further scores to give Saltash a 22-5 half-time lead. After the interval Morton crossed again before Ashes scored three late converted tries courtesy of centre Jason Carroll, Morton and Cruickshanks. Despite the scoreline, Tavistock coach Hammy Kerswill felt there were positives for his side. “For once we had a cracking start and came out firing and kept the pressure up for the next 20 minutes, even when we had a man in the bin,” he said. “There were a lot of positives from us, but Saltash are one of the best teams we have come up against. They did a job on us. They tired us out and then punished us out wide. They scored four late tries under the posts. Tavistock were missing a number of players and did had a debut to 18-year-old lock Seb Cox. Despite the loss, Tavistock stay ninth and will be hoping to continue their good home form next week against Tamar Saracens. Saracens remain second-from-bottom but coach Stuart Busfield was encouraged by their display in a 29-18 home defeat to Withycombe, who finished third last season. At one point it looked like Sarries might get something out of the game, but Withycombe managed to just keep them at bay. “We’re disappointed, but it was a real shift in the right direction by us,” said Busfield. “We were really tough and hard to beat. Busfield said his team’s performance was a massive improvement on the previous week when they were beaten 42-5 at home by Saltash. “Without a doubt it was the best game we have played,” he said. “Not necessarily for application or skills but for heart – the guys really fought and we played solidly for the full 80, which has been missing. “They (Withycombe) are a good side but the guys have come off disappointed not to have taken it, so roll on next week. Tom Rigby celebrated the birth of his son, Jacob, the day before by scoring a try and kicking eight points for Saracens, who also had Ty Colwill scoring. 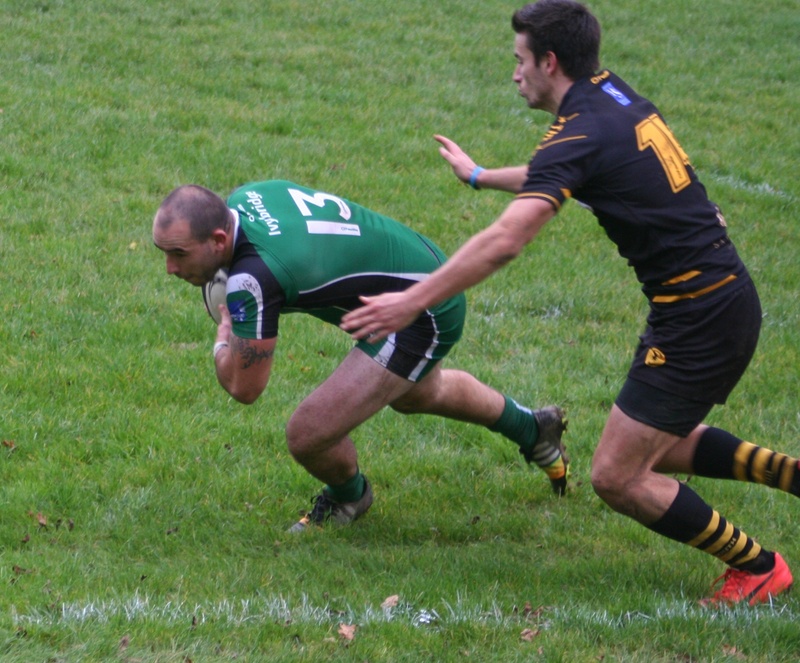 Plymouth Argaum are also hoping wins will start coming soon after a disappointing 23-10 home loss to Bodmin. Argaum were only three points behind with 20 minutes to go but Bodmin scored two tries in the final quarter. Injury-hit Argaum were not helped by losing second-row Nick Carter in the warm-up. He was called away as his wife went into labour, which meant a late reshuffle. But the Plymouth side took a 3-0 lead with an Ali Murray kick before Bodmin hit back to go 10-3 up. Argaum got back into the game with Jake Turfrey try after a brilliant run by Murray but that was as good as it got for the home team. They were not helped by suffering more injuries. The influential Troy Gobey and Dan Smith both had to come off with injuries, while Kevin Sidebottom also suffered a nasty knock to the leg.